How To Recover Deleted Email From Gmail. Things are missed when they are no longer available. Gmail being so popular webmail solution and many of us use it as a primary email ID like I do. There are many times you lost your mails and you end up wasting time in looking for ways to recover those mails. 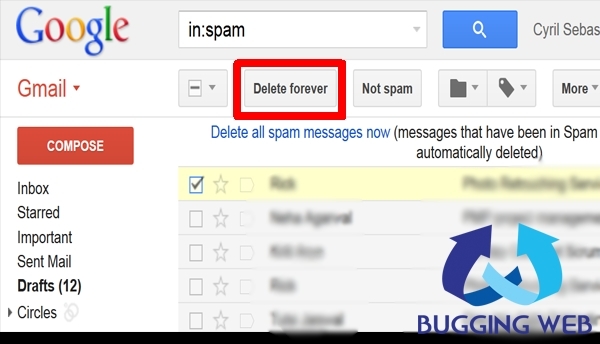 Today I would like to share tips to recover deleted email from Gmail even if you have deleted mails by pressing Delete Forever button. If you had deleted mail by pressing Delete Forever button then there is no way to recover the mails from the Gmail user interface. Related Post: How Do You Manage Your Bulk Mailing Solution? Many times Gmail accounts are compromised and when users manage to get their account back they find that all the mails are deleted from their Gmail ID. This is really a bad situation but you can recover those mails too. Ways to recover deleted mails. Normal Deletion: In this way you intentionally delete mails from your Inbox and the mails are moved to Trash folder. The email stays in Trash folder for 30 days and will get deleted automatically. Steps to recover from Trash. Recover from DELETE FOREVER: You can delete emails forever in two ways. This option gets activated when you check your emails in Spam folder or in Trash folder. If you click on Delete Forever button then there is no way you can recover mails from Gmail interface. But if you want to recover mails from your Gmail compromised account then you can file a report first and then recover all your mails from Delete Forever option. Gmail keeps a backup of all your deleted mails also. Google Apps mail retention: Google Apps for business is the premium version of the webmail which you are currently using. You can simply configure the deletion of mails from the admin panel as shown in the link. There are options like Google Takeout and or you can even take regular backup from Google Dashboard of all your profiles services but the best part is that Google mails are not backup with those services. « Claim your Yahoo username according to your wish.